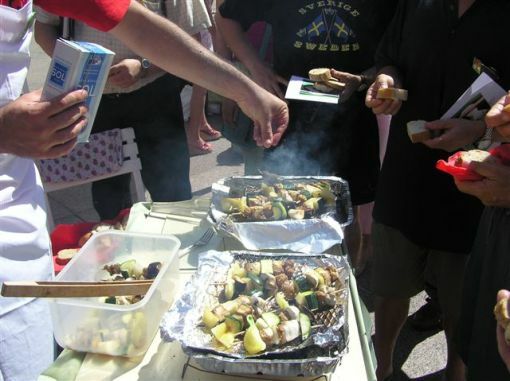 Animal Friends' activists, who are vegetarians for some time, wearing little more than aprons, will be giving away vegetarian treats right from the grill in order to show all advantages of vegetarian diet. The barbecue will take place on Saturday, July 24, 2004, at noon in Gajeva ulica in front of Hotel Dubrovnik. More and more people recognize vegetarian diet as ethical, healthy and ecological, and above all delicious with great variety of tastes. Vegetarian diet does not involve breeding, suffering and killings of over 43 billions of animals which are slaughtered in meat industry per year. Vegetarians are healthier and more vital, have fewer diseases, live longer, and by respecting lives of the others improve the quality of their own. If you practice vegetarian diet you avoid taking part in great expenditure of resources, wastage of food that could feed hungry people, deforestation and overwhelming pollution of the environment. Vegetarian diet helps your health, animals and the whole planet. You can read more on vegetarianism at www.prijatelji-zivotinja.hr or www.vegekit.com, and the activists will gladly chat with you over veggie treats from the grill. Organization's info stand will be set, the petition will be signed for introduction of vegetarian meals in public institutions by which Animal Friends fights for vegetarians' rights, that is, for their rights on meals. Action is modeled to very successful PETA's (People for Ethical Treatment of Animals) campaign "Lettuce Ladies" which last year's tour, in cooperation of Animal Friends and PETA, draw great attention throughout Croatia. With this action we are ending very successful year long campaign "Why Veg?" which was lead in cooperation with FARM organization (Farm Animal Reform Movement). We handed out over 100,000 leaflets, made several actions, set forty info stands and held twenty lectures and video projections in schools, high schools and colleges. 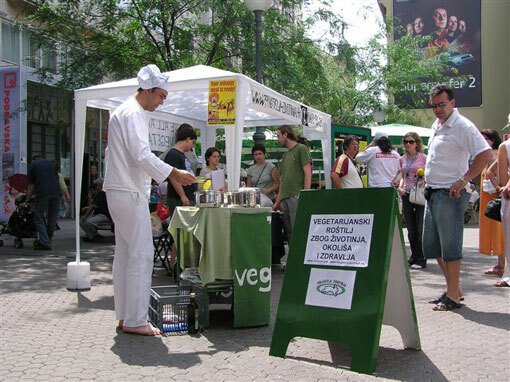 Two billboards promoting vegetarianism are set along streets of Zagreb. In Subiceva ulica there is billboard saying "Did Your Food have Eyes?," and the other one saying We are all vegetarians is in Savska ulica. The billboards will be displayed until autumn, and they can be viewed on our web pages.